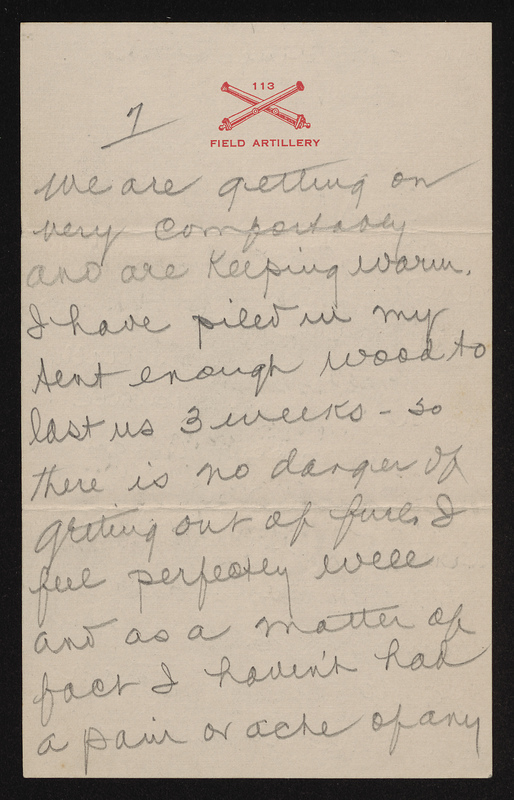 Letter from Richard Dillard Dixon to his father, written January 27th, 1918. 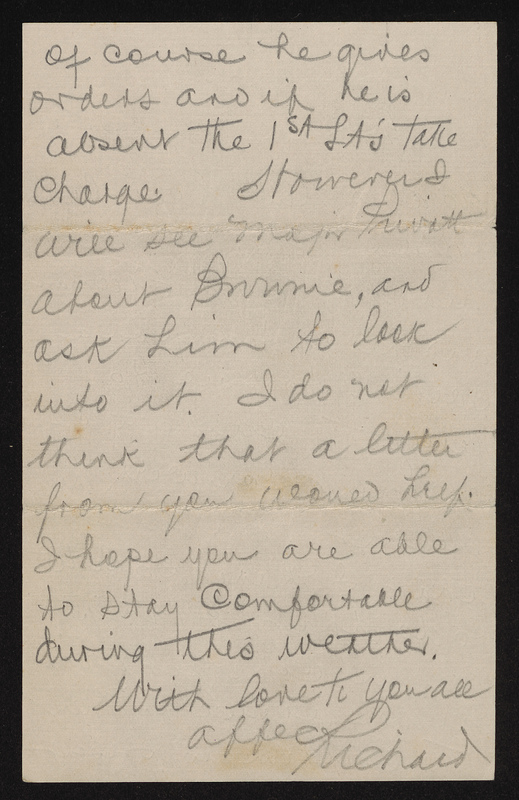 Several changes among the officers in our battery have taken place since I wrote you the last letter. Lieut. Davis2 has been transferred to us from Headquarters Co. to fill Lieut. Royster’s3 place. Of course he is a 2nd Lieut. He is a great big soldier a little larger than me and will make us a good man. Lieut. Morris4, one of our 1st Lieutenants has been transferred to the aviation section of the regiment and will leave in a few days for Fort Sill, Okla.5 for training. He will be out there 2 or 3 months. Capt. Weddell6 has sent in his resignation and has suggested me to the colonel7 to take his place as captain. I do not think however that they will appoint a 2nd Lt. as captain so please don’t expect to hear that I have received it. 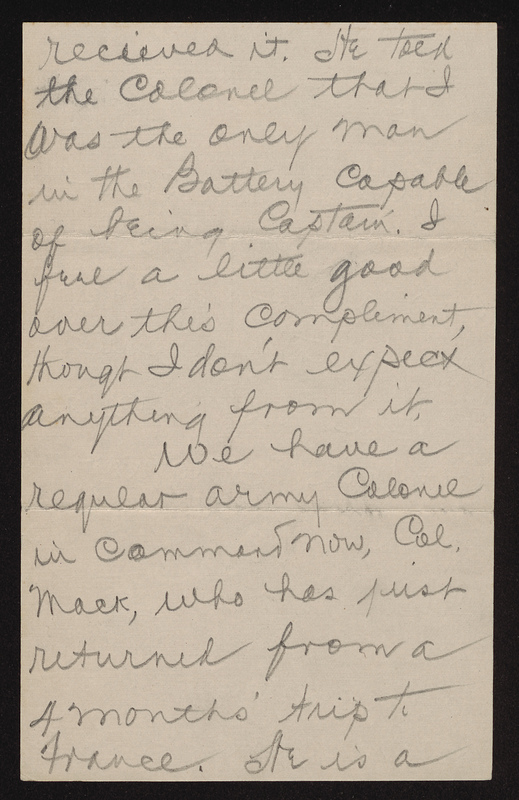 He told the colonel7 that I was the only man in the battery capable of being captain. I feel a little good over this compliment, though I don’t expect anything from it. We have a regular army colonel in command now, Col. Mack7, who has just returned from a 4 months’ trip to France. He is a West Pointer and has braced up things since coming here. I do not know when Colonel Cox8 will return or if he will return at all. We never know anything in advance in the army. After 12 or 15 severe snowstorms during the past month it has now started raining and has kept it up for 3 days. 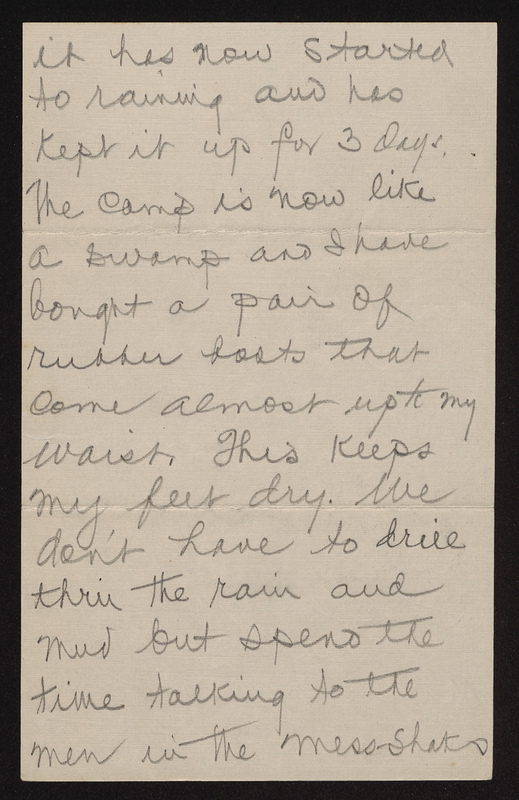 The camp is now like a swamp and I have bought a pair of rubber boots that come almost up to my waist. This keeps my feet dry. We don’t have to drill thru the rain and mud but spend the time talking to the men in the mess-shacks. We are getting on very comfortably and are keeping warm. I have piled in my tent enough wood to last us 3 weeks–so there is no danger of getting out of fuel. I feel perfectly well and as a matter of fact I haven’t had a pain or ache of any moment since I joined the army. I received yesterday your letter of the 24th and was so glad to hear from you. There is really no need for Brownie9 to talk about resigning–that would be a very childish thing to do. His major10 is not going to require him to do more than Brownie9 is able to do and then hold him to account. 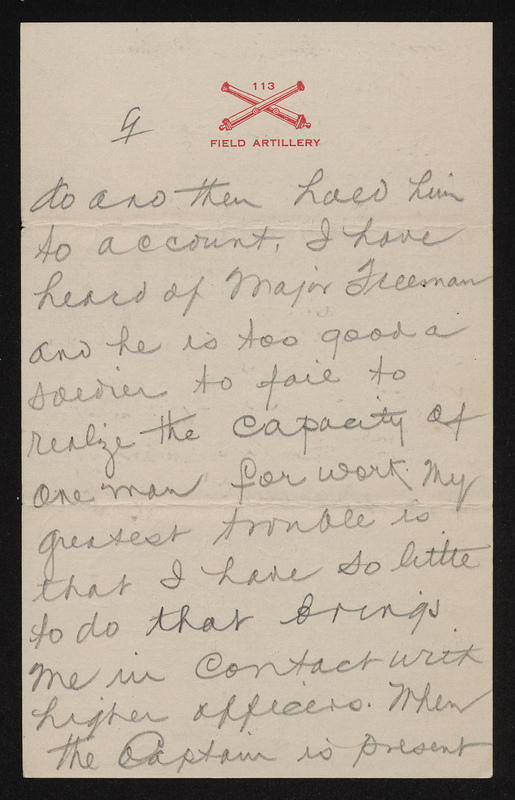 I have heard of Major Freeman10 and he is too good a soldier to fail to realize the capacity of one man for work. My greatest trouble is that I have so little to do that brings me in contact with higher officers. When the captain is present of course he gives orders and if he is absent the 1st Lt.’s take charge. 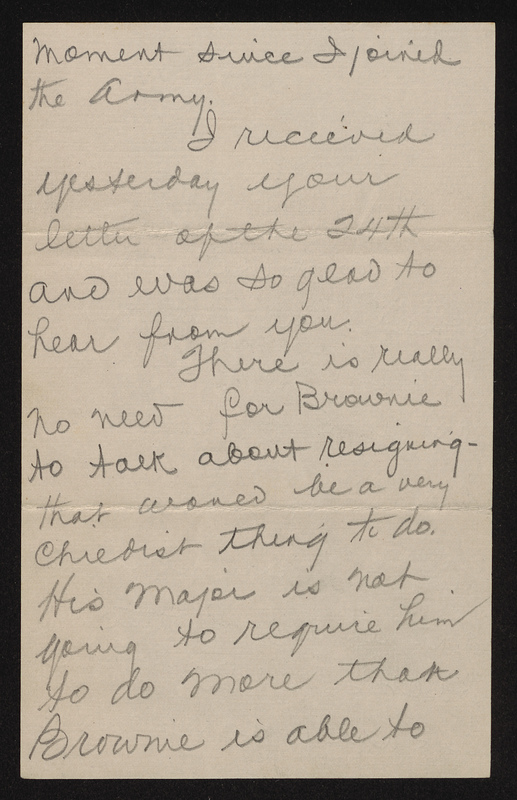 However, I will see Major Privatt11 about Brownie9 and ask him to look into it. I do not think that a letter from you would help. I hope you are able to stay comfortable during this weather. Originally from Wilson, North Carolina, Davis worked as a bookkeeper. Inducted into federal service from the National Guard, he quickly climbed from the enlisted ranks to an officer’s commission. 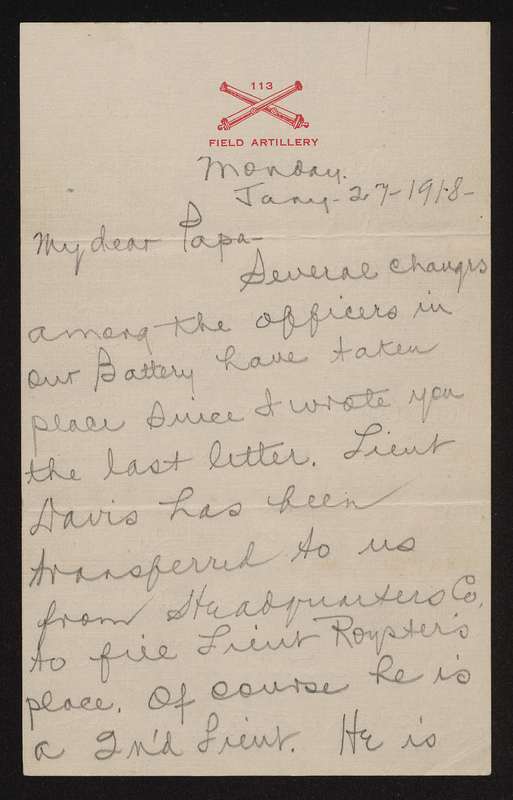 Although sent to France with the rest of the regiment, the army brought Davis back in September 1918 to train artillerists at camps in Maryland and Michigan. After the war, he returned to Wilson and operated a tobacco shop. Son of state legislator and Adjacent General of North Carolina, Brigadier General Beverly S. Royster Sr., Royster grew up in Oxford, North Carolina. He graduated from UNC-Chapel Hill in 1914 and became an attorney. Like his father, he served in the National Guard and entered national service when President Woodrow Wilson federalized the guard in the summer of 1917. Royster eventually became a captain in charge of a field artillery battery in the 113th Field Artillery. After the war, he returned to Oxford and practiced law. Born in Norfolk, but raised in New Bern, North Carolina, Morris worked as a billing clerk for the Atlantic Coast Line Railroad. Inducted into federal service from the National Guard, he trained in Texas as an aerial artillery observer for the regiment. After the war, Davis married Susan Roberts Guion, sister of fellow 113th Field Artillery veteran William Blount Rodman Guion. He later worked as a salesman for the local Ford Motor Company dealer and as a bookkeeper. Morris attended the School for Aerial Observers at Post Field, the airfield established at Fort Sill in 1917. For more information on the school, see https://www.army.mil/article/72212/fort_sill_birthplace_of_army_combat_aviation. The entry in The Encyclopedia of Oklahoma History and Culture on Fort Sill contains more details about the army base during World War I, link: http://www.okhistory.org/publications/enc/entry.php?entry=FO038. Originally from Martinsburg, West Virginia, Weddell served as a 1st Lieutenant in the 1st West Virginia Volunteer Infantry during the Spanish-American War. The war ended before the regiment completed training in Georgia. Around 1903, Weddell moved to North Carolina to serve as a superintendent for the Blades Hosiery Mill. He also worked for a time as a life insurance agent before becoming a manager for Pepsi-Cola Bottling Company in 1911. A member of the National Guard, Weddell entered federal service as a captain. However, age forced his resignation on February 1, 1918. Pepsi-Cola transferred Weddell to their plant in Memphis, Tennessee, where he lived until his death. Born in Orangeburg, South Carolina, Mack received an appointment to West Point in 1899. Graduating with the Class of 1904, he received a commission as a 2nd Lieutenant in the artillery. 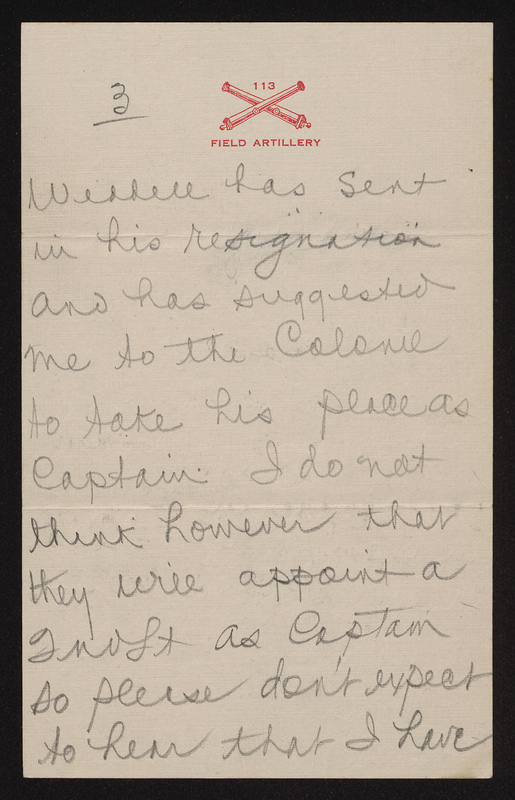 By World War I, Mack was a captain in the Coast Artillery Corps. Served with the 7th Field Artillery in France before arriving at Camp Sevier to serve as a trainer and temporary 113th Field Artillery commander. Remained in the United States as an artillery instructor for the rest of the war. Retired from the army in 1930. Younger brother of Richard Dillard Dixon. Attended UNC-Chapel Hill from 1914 to 1916, where he belonged to the Phi Delta Theta fraternity. Went into the wholesale grocery business with his older brother, Minton Hughes Jr., in Plymouth, North Carolina from 1916 to 1917. Enlisted in the North Carolina National Guard on May 25, 1917. Due to his college experience, selected for officer’s training on December 27, 1917. 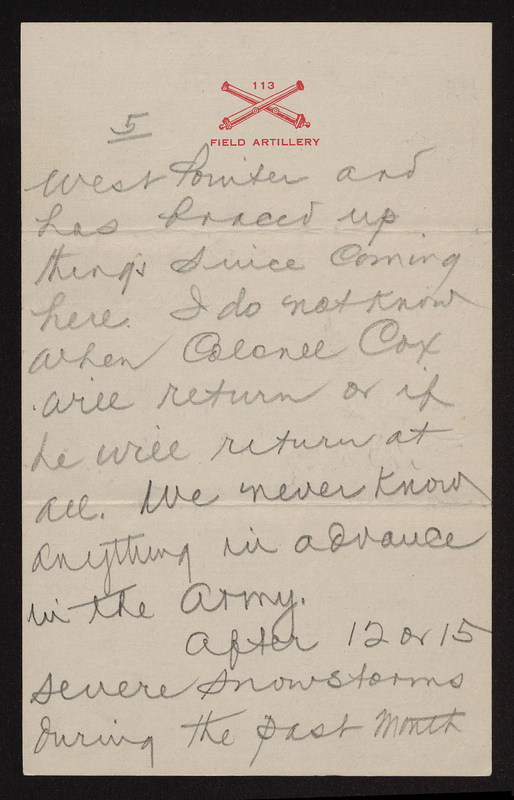 Commissioned as a 2nd Lieutenant in the 119th Infantry, Dixon resigned for mysterious reasons on March 27, 1918. About two months later, he reenlisted, this time in the Marine Corps. After completing basic training at Parris Island, served at the New York Marine Corps Barracks in New York City. Reached the rank of corporal. Never left the United States during his military service. After his discharge from the Marines in February 1919, moved to Suffolk, Virginia to work as a manager for Winborne & Company, a wholesale grocer. Later became a salesman for the local peanut growers’ association in Norfolk, Virginia. Ultimately returned to Suffolk, where he worked as the Secretary-Treasurer of the Benthall Machine Company, a firm that manufactured peanut harvesters, until his death. Son of a Goldsboro, North Carolina music teacher, Freeman graduated from UNC-Chapel Hill in 1911. A National Guardsman, Freeman entered federal service as a major and rose to the rank of lieutenant colonel. 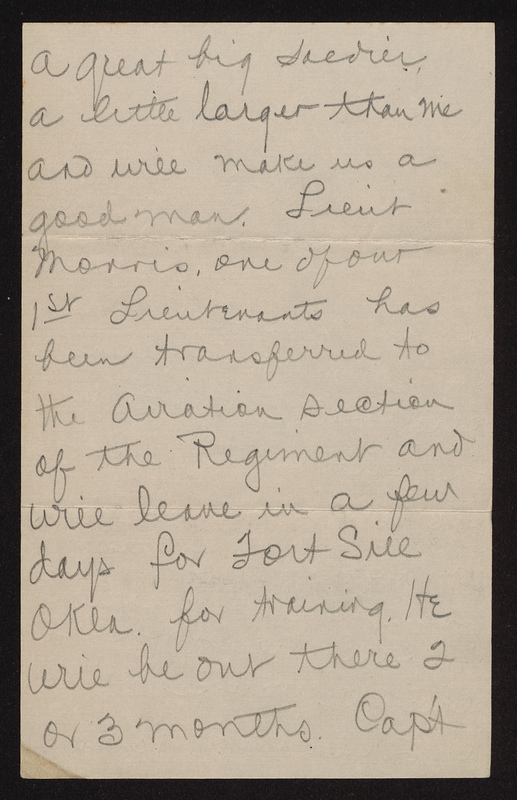 Sent to France before the rest of the 119th Infantry arrived, Freeman received an attachment to the American Expeditionary Force’s staff college. Upon his return to America, Freeman attended law school, earned his license, and practiced in Charlotte. He served as the statewide commander of the American Legion from 1929 to 1930. A graduate of Wake Forest College, Privott served as a state senator prior to the outbreak of war. An officer in the National Guard, he became the commander of the Third Battalion, 119th Infantry. After the war, he returned to his hometown of Edenton and worked as a state prosecutor.